Exclusive Masterpiece Gameplay from Smash Bros.
Just like in Super Smash Bros. Brawl, there will be a masterpiece mode in which you can play the classic games from which the fighters in Smash originate. 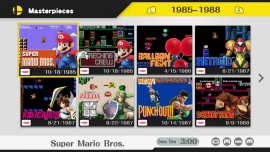 In the newest iteration of Smash, there are two Legend of Zelda games included, those games being The Legend of Zelda and Zelda II: The Adventure of Link. Thanks to our review copy of the game, we have uploaded our own little features on the two games. You can find those above, and much more on our YouTube Channel. And keep an eye out for our review of Super Smash Bros. for Wii U, due out in the next few days!